Necklaces displayed on a peg board and in packages on the table. flea markets. 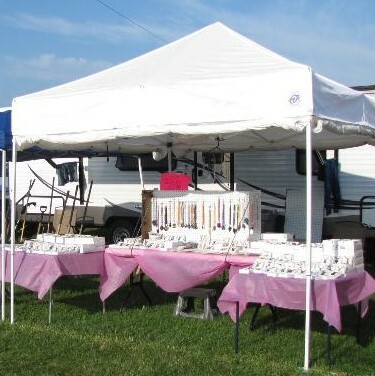 The set-up costs including at least electric hook-ups give us not only very cheap camping but a chance to make some money by selling our wares. What do we sell? 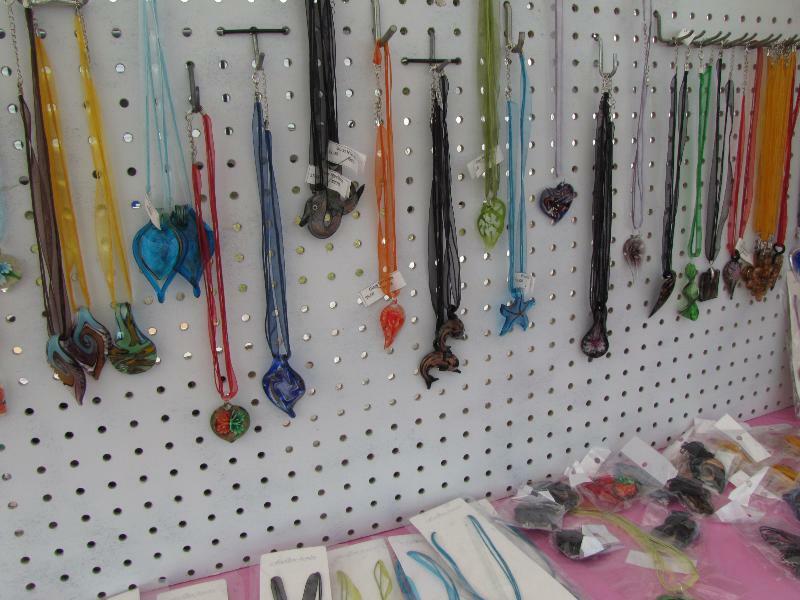 The main product we sell are hand made glass necklaces. We got a great deal on 5000 units about a year and a half ago. ( I won’t advertise our source here but contact me if you want details.) Necklaces like these have been around a while. Often our customers will comment that they have bought some at other places. This is fine, as we have a huge variety and they usually buy one or two more from us! The price? We normally sell these for $5.00. At one large ten day festival we had two prices: $5 and $7 depending on the style. This two tiered pricing worked fairly well, though we have not used it at three or four day events. We have also sold “cooling” neck and head bandannas with great success. You have to look for good wholesale pricing on these to be profitable. We also have had reasonable luck with cheap imported turquoise necklaces. Both these items we have found on Liquidation.com, an auction site where you can find about anything!